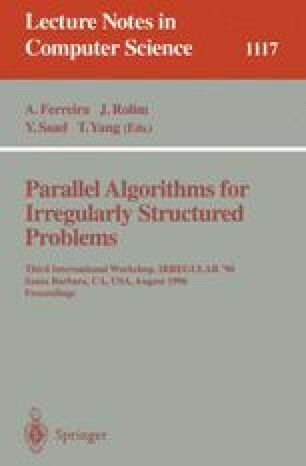 Irregular scientific applications are often difficult to parallelize due to elaborate dynamic data structures with complicated communication patterns. We describe flexible data orchestration abstractions that enable the programmer to express customized communication patterns arising in an important class of irregular computations—adaptive finite difference methods for partial differential equations. These abstractions are supported by KeLP, a c++ run-time library. KeLP enables the programmer to manage spatial data dependence patterns and express data motion handlers as first-class mutable objects. Using two finite difference applications, we show that KeLP's flexible communication model effectively manages elaborate data motion arising in semi-structured adaptive methods. This research is supported in part by ONR contract N00014-93-1-0152 and by the DOE Computational Science Graduate Fellowship Program. Computer time on the Intel Paragon at the San Diego Supercomputer Center was provided by a UCSD School of Engineering block grant. Access to the IBM SP2 was provided by the Cornell Theory Center.